"If you enjoy reading, relaxing and remembering, you're going to love this memoir ... it's a wonderful trip down memory lane. Hardly a page will turn when mention of some personality, place or event won't hit a response ... It will trigger chuckles and smiles, nodding heads of agreement and sighs of appreciation of an American life and culture that may be headed for extinction. 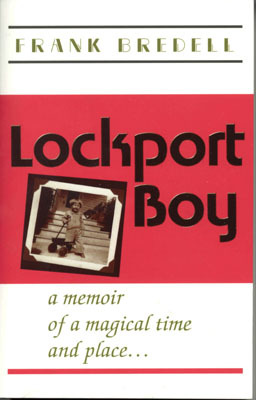 I believe this is the only book of its type about Lockport." The story will be appreciated by anyone who grew up in a small town in the 30's and 40's. It is a good natured portrayal of an era." Even if you didn't grow up in Lockport, you'll enjoy the true stories of weird and wonderful teachers, the cat that almost ruined Christmas, "smoking" twigs and how a 30-mile trip to Buffalo was an almost unbelievable adventure.